Welcome to our Stamp of the Month Blog Hop! 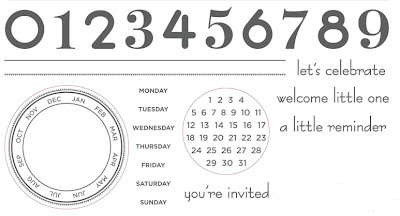 We will be featuring January's SOTM, Little Reminder, a set of 25 stamps. If you have come here from HELEN'S BLOG you are on the right path! The blog hop is a great big circle, so you can start here and work your way all around. If you get lost along the way, you’ll find the complete list of participating consultants here. This month we have over 50 Close To My Heart Consultants sharing their creations using this month's SOTM and other great CTMH products on their blogs. Following the blog hop is simple to do - just click on the link at the end of the post on each blog to move to the next one! Here we go! What a great little set! I love the numbers! This month I created a layout for my Daughter's 17th birthday. She LOVES Zebra print so I used the paper from Roxie Level 2 paper pack (X7140B) for this layout. Each year, the new Twilight movie comes out either the day before or ON Kayli's birthday so she and her friends celebrate her birthday by seeing the movie! This year, the new movie actually came out on the same day as her birthday. I used the Little Reminder to mark the date of this layout. I used the TOP HAT layout pattern from Jeanette Lynton's How To Book - Magic. I used the Art Philosophy cricut cartridge to cut out the circles and also the banner that I used to cover the matching die-cut banner. For the date, I inked the stamp in black and then used a wet wipe to wipe away the black ink from "NOV" and "19". I used the Tulip marker to color them so that the date would stand out. I stamped the numbers 17 and cut them out to note her age! Also - Here is a fun birthday card I made using this set. 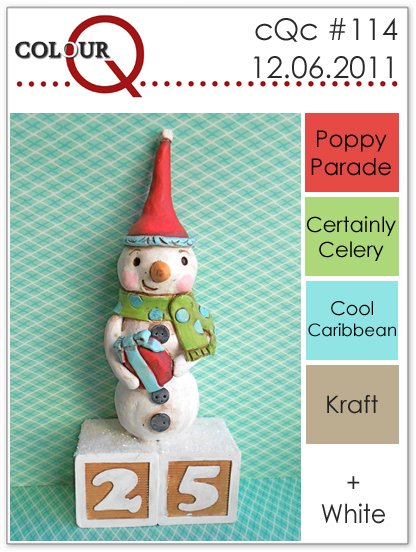 I was browsing through my new Paper Crafts Get Inspired magazine and was inspired by a card made by Kimberly Crawford. She used numbers on a Kraft card. I created a similar card with this stamp set! I stamped the "let's celebrate" sentient onto the white grosgrain ribbon. 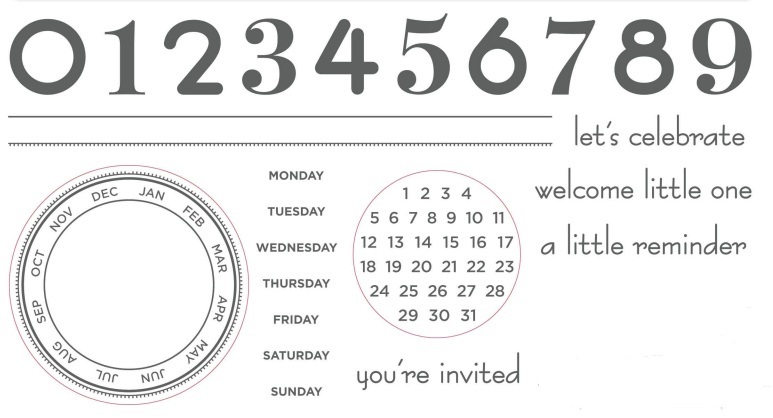 I used Pacifica, Tulip, Topiary and Sunflower along with Black Ink for my numbers. I stamped the numbers randomly on a 6x6 Kraft card (Z1474). The fabric covered brad is from the Fanfare Designer brads (now retired). It holds down my scalloped flap. Remember, you can get this Little Reminder stamp for only $5 with the $50 Close To My Heart purchase! See my website www.ctmh.com/stampinheaven to order or contact me! Now, hop on to GEORGIA'S BLOG to see what she created! If you haven't heard, January is National Stamping Month. Close To My Heart has a great little deal going on all through the month of January. When you purchase $25 in Close To My Heart products, you can add the Rock The Block special for only $15. This is a fantastic deal! You get a My Creations Cubes along with an E-Size Rock the Block stampset. I wanted to create some cards with the stamp set. I used the colors from the ColourQ challenge for this card. The colors were Black, White and a color of your choice. I chose Olive for my Black and White card. For a sharp black color, I used Black Staz On ink (Z888). It stamps so pretty! I stamped the flowers with Olive ink and then cut them out. The centers of the flowers are Black Button Brads from the Mini-Medley Black Collection (Z1393). The ribbon is actually retired but still available on the While Supplies last section of my website for only $4.00. You get 4 yards of 6 different ribbons! 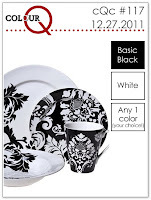 See the While Supplies Last section HERE for some great deals! Here is a picture of the My Creation Cubes and the Rock The Block stamp set. If you missed my post on my Rock the Bock Cubes you can see it HERE. Remember! This special is only available until January 31! The cubes will be in the 2012 Spring Summer Idea Book but the stamp set will not! Order directly from my website or contact me today! May This Be Your GRANDEST Year Yet! Christmas is past and the New Year is fast approaching. I had so much fun the last couple of months creating Christmas cards! But it's time to put away all my Christmas stamps and start some new projects! I've been planning a technique card workshop in January and needed one more card. 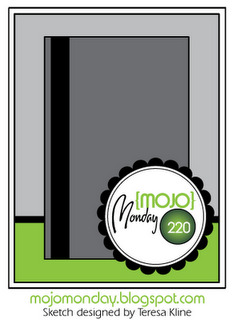 Mojo Monday provided the perfect sketch to use! My workshop - Cards With EDGE will be focusing on embossing! 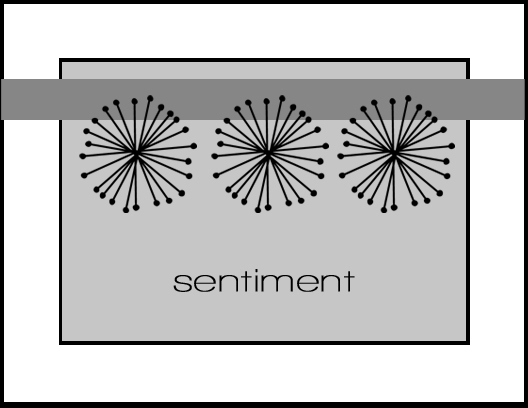 This card is one of four cards we'll create. For this card I used the Hooray Bouquet (D1491) stampset which coordinates with our Art Philosophy Cricut Cartridge (Z1686). I cut the large flower <Flower6> at 2 3/4" and a smaller flower at 2". The large flower was cut onto the Sorbet B&T from Elemental Level 2 (X7141B) and the smaller 2" flower was cut on Colonial White Cardstock. Even though the large flower was a print, I stamped the flower with the coordinating stamp using versa mark ink. I then heat set Clear Detail Embossing powder to give it a textured design. I used the coordinating 2" stamp and Olive ink on the smaller flower. I re-stamped the image using Versa Mark ink directly on top of the stamped flower. Next, I used Clear Detail Embossing powder to add shine to this flower also. I layered the two flowers together and added a Colonial White Designer (Z1274) brad to the center. The small flower next to the sentiment used the same technique with the Olive ink and Versa Mark ink. All products are Close To My Heart. See all the details on my Cards With EDGE workshop on my Upcoming Workshops page! I've been missing in action since Sunday's blog post about our special Rock Around The Block. This week has been crazy busy. I worked Monday & Tuesday and then drove up to Kentucky to get Jeff's mom so she could spend Christmas with us. We came back Wednesday. Thursday was a cold rainy day and instead of spending time in my craft room - something I LOVE to do on rainy days - I spent the day in the kitchen baking lots of goodies for Christmas. Thursday, I took Jeff's mom to see his office, Kirsti's apartment and then met Kayli out at The Avenue for Lunch with the girls and Nana. It was a good day but I think I wore Nana out! Today is quiet. Both girls are working all day and Jeff went hunting this morning. I was bound and determined to make one more Christmas card. This is my Christmas card to ALL! Thank you to those who follow my blog, to those who just like to look occasionally and also to all my fabulous friends and customers that keep me going. I love you all! I hope you have a Very Merry Christmas! I used one of my VERY FAVORITE stamps and paper for this card. The stamp is from Father Christmas (D1449) and the paper is from the retired Mistletoe pack. I stamped the Santa in Brown StazOn ink (Z1142) and then I used a combination of blending pen and markers to color him in. I filled in the three ornaments with our Bronze Glitz Glitter Gel (Z1483). I used the velvet ribbon from the Cocoa Designer Ribbon Collection (Z1316) and embossed "Merry Christmas" with Cocoa Embossing Powder. I used the Mojo Monday Sketch for this card. I'm also entering this in the H2H Holiday Virtual Christmas Card Exchange! HAVE A MERRY CHRISTMAS! I'll be back next week! January is National Papercrafting Month! 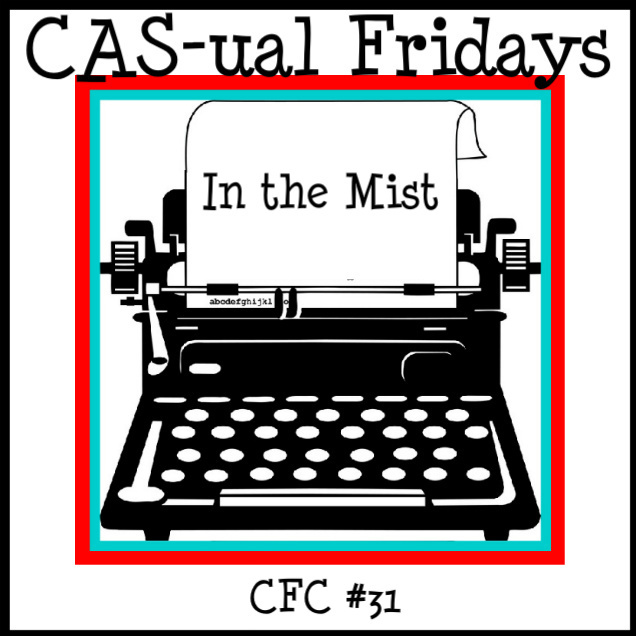 Close To My Heart is once again introducing a fun new project to celebrate! Starting today, December 19 through January 31st, you can order this special Rock the Block set! This set includes the My Creation Collage Cubes (a pre-view to one of the New Products in our 2012 Spring Summer Idea Book!) and an EXCLUSIVE fun E-size stamp set! There are so many great things you can do with these cute little 2x2 collage cubes! To help give YOU some ideas, several Close To My Heart consultants are participating in a Rock The Block Blog Hop! If you came here from Mary's blog, then you are on the right trace! When you are finished seeing what I created, hop over to the next blog and get inspired! I decided to create a Family picture collage! I used the Dreamin' stickease to accent my cubes along with the stamps. Stickease is a great way to decorate your cubes because they look dimensional (like my buttons) but are flat so that your cubes won't be wobbly! I applied my pictures and cardstock to my cubes using our Bonding Memories Glue. Here are pictures of each side of my cubes! For the Final Side - I decided to make a display and took the blocks out of the box! You can make a phrase or words to display on your mantel or desk! And finally, here is the box that holds the cubes! Isn't the stickease just perfect?! After I finished this box I thought about the Believe stickease and how that would make a really cute collage of Christmas pictures! 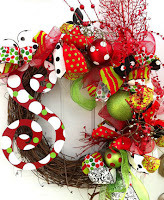 Now hop on over to my wonderful friend Krista's blog and see what she has created for you! If you'd like to order the special kit, you can order directly from my website at closetomyheart.com/stampinheaven or contact me! This kit is a $44 value and you can get it for just $15!!! (with a $25 purchase). The collage cubes will be available in the new 2012 Spring Summer Idea Book but the stamp set is exclusive to this special! It will NOT be in the Book! So order today! Here is a quick and easy treat that is a MUST HAVE in my family at Christmas each year. I make a huge batch and put in little Christmas bags and tins to share with family and friends! I thought it would be fun to share with you! This recipe is enough to use up the entire boxes of cereal and pretzels. I mixed this up in 3 separate batches using 6 squares of the White Chocolate Bark at a time. Using a BIG bowl, pour in a little bit of each of the above until the bowl is full. Melt 6 squares of the the White Chocolate Bark in a glass bowl in the Microwave at 30 second intervals stirring after each interval. Chocolate usually melts in about 1 min 15 seconds. Pour melted White Chocolate over the cereal mix a little at a time and stir after each addition to coat the mix. Pour out onto wax paper and let cool until White Chocolate is hardened - Only takes a few minutes. Here is my final card that I created for my Sonoma Card Box project. I create 8 cards to go into this Card Box that I created a while back. You can see it HERE. 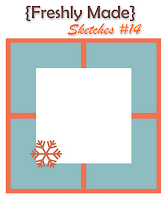 I was inspired by this sketch which I found over at the Try Stampin' On Tuesday blog. I varied it just a little but the basic idea is here. My lacy scallop is actually one of zip strips from the Sonoma Level 2 paper. I used my corner rounder (with the guard removed) to make the straight edge into a scallop to match. My stamped frame is from the stamp Sweet Moments (C1467). I used Smoky Plum ink to color the butterfly (from the Just Blooms Flutter Paper Shapes Z1463). I added pewter brads. My Birthday sentiment is from Card Chatter - Birthday (D1475). I just love this set! My cards are now all complete and I have wrapped them up and they are being sent on their way! I hope my Grandma enjoys her box of handmade cards! I finally sat down and finished my final 2 cards for my Sonoma Card Box. Remember that little project? I know, I started it several months ago and have been making cards here and there to add to the box. This is a Christmas Gift for my Grandma. I hope she likes it! I used the sketch from Clean and Simple Stamping for this card. It is really simple but elegant I thought. If you missed my post on the Sonoma Card Box you can see it HERE. I won the "Make It From Your Heart - Cricut Sonoma Category for this card box! Recipe for a Cookie Swap! I just returned home from my annual Cookie Swap. I have some of the best friends in the world and for the 9th year in a row we got together for our annual Cookie Swap. We started out as a group of friends that loved to scrapbook and the amazing thing is - we all worked together. Even though some of the girls no longer scrapbook and we've kind of scattered to other departments or jobs, we have remained friends through out these past 9 years. It is a night full of laughs, remembering good times, and of course LOTS of great cookies! Since I have Close To My Heart's new Art Philosophy cricut cartridge, of course I had to make my recipe into a Christmas tag! For my Recipe Card I cut a 6" tag using Shift Tag <Tree 1>. This tag has a little cut out tree on it. To get the recipe onto the tag, I typed the recipe into a text box in Word. I then printed out a copy on a sheet of paper. Next, using removeable adhesive, I attached the tag to the sheet of paper with the recipe on it Close To My Heart's Believe paper. This one is a plan tag (no cut out tree). I cut this tag at 6 1/4". I then cut a small tree <tree 1> at 2" in Sweet Leaf Cardstock to apply to the center of the cut out tree on the recipe card. Here are my finished cards tied onto my cookie boxes! Here are all the cookies! How CUTE! and oh so good! My best buds at the Cookie Swap! Be sure to check out all the really cute tags! Well I didn't get much scrap therapy in yesterday. It was late when I finally did get in there. I started out attempting to do the challenge from Friday Mash-up which was to Create a project with a snowman and/or use their colors combo - which would have been Blush, Twilight and Grey Wool in the Close To My Heart color world. I had a snowman in mind I wanted to use but when I went to get it I couldn't find it. I finally decided it must have gone to my sale box! But I did find another one to use. I decided I would use the sketch from Freshly Made Sketches. I had so much trouble coming up with something I liked using the colors from Friday Mashup. It was late and my brain just couldn't get past the traditional colors for Winter and Christmas. I finally threw aside my Blush cardstock and stuck with Grey Wool and Twilight. 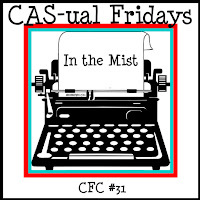 I'm also entering this into CAS-Friday because I used the spray pen! Although I had trouble with the colors over a Friday Mashup, you need to go check out the other artwork. There are some really pretty things with this combination! Come back to see me tomorrow! I'm going to a Cookie Swap tomorrow night so I'll be sharing my yummy recipe! 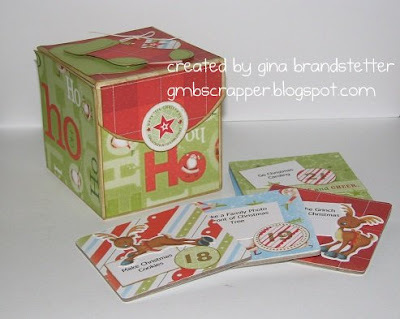 Memory Game - Make it an Advent Box! I just realized I never blogged about my Advent Box! This turned out so cute I wanted to share! I had a workshop back in October on this cute little box made using Close To My Heart's Memory Game. The Memory Game (Z1614) comes with 24 3x3 chipboard squares all in a little box that has a magnetic flap for closure. You can put photos on one side and cover the other side with a pretty pattern paper. Since there were 24 squares I thought this would be a great opporutnity to make an Advent box with an activity every day. This was so easy to assemble. I used the Believe Level 2 Paper (X7145B) to cover the box and for each square. To decorate my squares I used the Believe Stickease (X7145C) and also the Countdown (B1390) stamp for the numbering of the days. The stickease is perfect because it adds dimension to your squares but not a lot of depth. You want your cards to lay flat ... and also fit in the box! I used the Art Philosophy cartridge to cut out the stocking and ornament for the top of the box. Check out the toe and heel of the stocking! It is the "Countdown to Christmas" phrase from the Countdown stamp to make is look like stitching! TILES – cut 3x3 squares from the various papers & cardstock included in the Believe Kit. I know we are already into December but you can get one of these Memory Games now and make one for next year! Since these colors go with this week's Heart 2 Heart Inspiration photo I'm going to enter it into this week's challenge! WOW 2 entries on one challenge - I've never done that before! I'm back! This time I've got a little Christmas gift bag to share! I made this bag from my Kraft cardstock using Close To My Heart's exclusive Art Philosophy Cricut Cartridge. The bag was cut using the 6" measurement. Once the bag is folded and glued together, it is actually 3" wide x 2" deep and 5" high from top of handles to the bottom. I used CTMH's Believe (X7145B) paper to wrap around the bag and used the zip strip from that same paper for a border. Isn't that cool? I cut two ornament tags, again using the Art Philosophy Cartridge. The Sweet Leaf tag was cut at 2" and the Holiday Red tag was cut at 1 3/4". I stamped the Holiday Red tag with my Versa Mark Ink and heat embossed White Embossing powder on the image. The stamp is from December 25th (C1469). This set is a great set for making quick tags. I posted a video a few days ago about this. If you missed it, you can see it HERE. I was inspired to make this little bag by this week's ColourQ Challenge. The colors were perfect and we were supposed to make anything EXCEPT a card! A nice little change for me! These colors also go along with this week's Heart 2 Heart challenge so I'll be entering this one over there too! Be sure to check out both challenge blogs! You'll get lots of great ideas! Check out this amazing give-away over at "Creating from the Heart" Keepsakes by Melissa. Be sure to become a follower of her blog and sign up for this amazing give-away! I'll be back later with another creation from my corner of StampinHeaven! :) The last few days I've taken a wee break - looking for some Christmas Mojo! There are so many Christmas movies that I love to watch year after year but I think there is only one that brings back Christmas memories each time. Would you believe that would be the Grinch Who Stole Christmas?! You must wonder why THAT movie? Well, when my husband and I were getting ready for our first Christmas together (over 25 years ago) we got our very first tree. I remember making felt ornaments (stitched them together by hand!) because we didn't have ornaments for our tree - we actually didn't have ANY decorations. The night we were ready to set up the tree and decorate, we turned the TV on and the old animated version of The Grinch came on. Every year after that, when we set up our tree and began to decorate, like clockwork - The Grinch was on TV! So - it is tradition. Now we watch the movie - The Grinch. It has become an all time favorite in our house! So if it's not running on TV when we decorate - we'll pop in the movie! Today when I see bright greens, pinks and blues at Christmas time, I always think of the Grinch. That is why I created this card in those colors. The tree on the stamp I used even looks 'Grinchy'. (if that's even a word!). The stamp set is Tannenbaum (B1361). 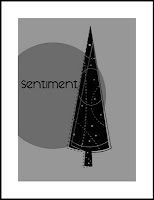 I used Silver embossing for the detail, the present, and the sentiment. Although the Twinkle Brads Jolly Assortment (Z1220) are retired you can still purchase them from the While Supplies Last section of my website for only $1! The polka dot paper is from the Believe Paper Level 2 (X7145B) paper pack. The square was cut using my Art Philosophy cricut Cartridge <square 2> at 3". I used the sketch from Clean and Simple Stamping for this card and I'm also entering this card into the Crazy 4 Challenges - "Favorite Movie challenge CAC116"
I'm also linking this up to this week's Tuesday Trigger over at Moxie Fab World. It goes perfectly with this week's inspiration picture - Deck the Halls! Do you have a Christmas movie that brings back a fun memory? I'd love to hear about it! If you are looking a quick and easy way to make Holiday Gift Tags, watch this short video by Close To My Heart. 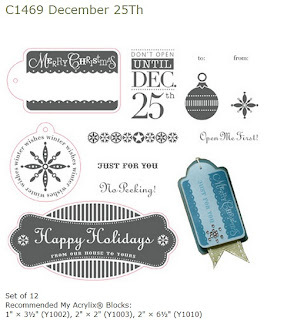 These tags are made using our Art Philosophy Cricut Cartridge and this stamp - December 25th (C1469). (See the red lines around some of the images? These images can be found on the Art Philosophy Cartridge!) All some bling with our Clear Sparkles (Z1104) and you're ready to tie them on your packages! Looking for the December Stamp of the Month? You can get right to it HERE. It's been a long time since I've colored with markers. Lately when I've been coloring my images I've used the blending pen with ink, or watercolor pencils. When I saw the colors in the Color Throwdown Challenge this time I just knew I had to use my Close To My Heart Markers. So I stamped some images and set to coloring! Aren't these great colors? 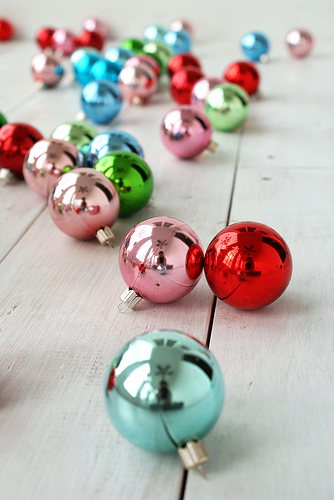 Would you think of Christmas for these colors? I did! I used Close to My Heart colors Outdoor Denim, Olive, Cranberry and Honey. I had fun with this 6x6 card. The stamp set is Christmas Cheer (D1491) which is perfect for coloring. I added some Red Glitz Glitter Gel for a little accent under the Merry Christmas. I also scissor distressed the edges of each cardstock piece to bring out the white core. I used "One the Side" sketch from Jeanette Lynton's How To Book - Originals for this card. I LOVE these How To books!